When we moved into this house the previous owners left us with a beat up old unfinished shelf unit in the garage that had seen better days. However, it was still quite sturdy and I felt very functional even though Mr. VPM and T felt like it had seen its best days and needed to be sent to the dump. So, I set out to prove them wrong and turn it into a pretty little Kitchen Shelf Unit. I love when I can recycle something that is headed for the dump and make it into something useful and beautiful. I don't have a picture of what it looked like before because this was done on a whim. I simply had a can of paint in my hand and started on it. It was unfinished wood and had some old dings and stains on it. I simply wiped it down - it didn't need any sanding - and began to paint. 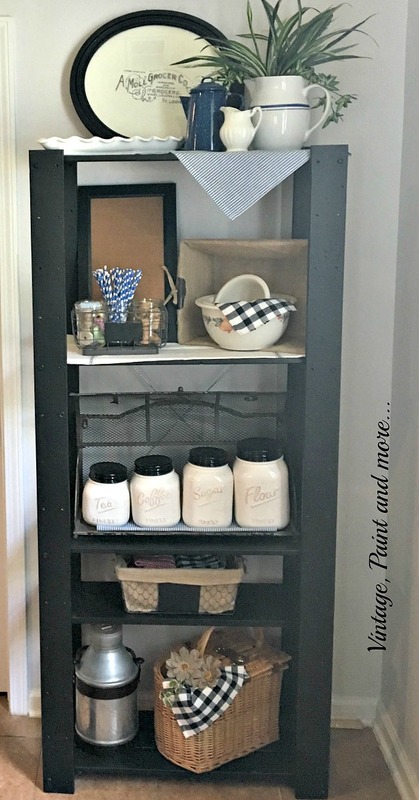 Of course, I used that trusty little can of black chalkboard paint I love so much. It took two coats and when I was done with it I was in love. I mean how good does that look and just right for my vintage industrial kitchen. I then set about to merchandise this little baby with lots of "vintage" goodness. The top shelf is my favorite. 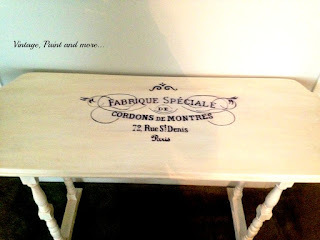 I diy'd a vintage kitchen sign that you can read about here - one of my favorite projects. 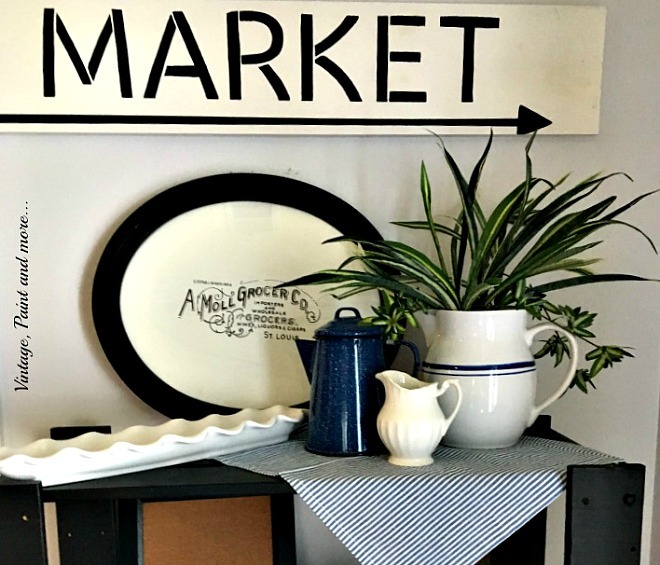 Then I added a blue striped napkin, an ironstone pitcher with a "faux" green plant, an ironstone cream pitcher, a blue splatter ware pot, and a snack tray I picked up at a local pottery store. I love how they just blend together to make a perfect little vintage vignette. The second shelf is filled with a bit of vintage and a bit of industrial. 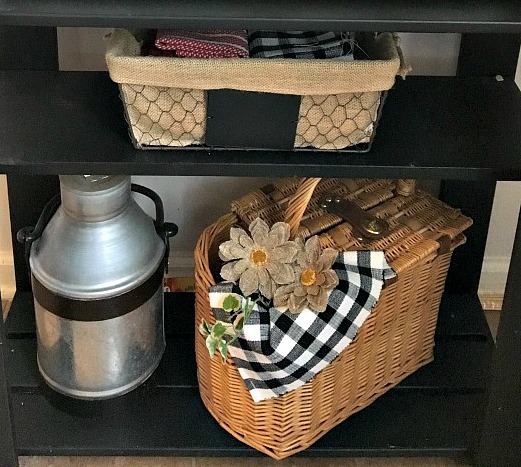 First off the burlap lined basket is a Hobby Lobby find at a very deep discount. I filled it with some crock bowls I have had for years. 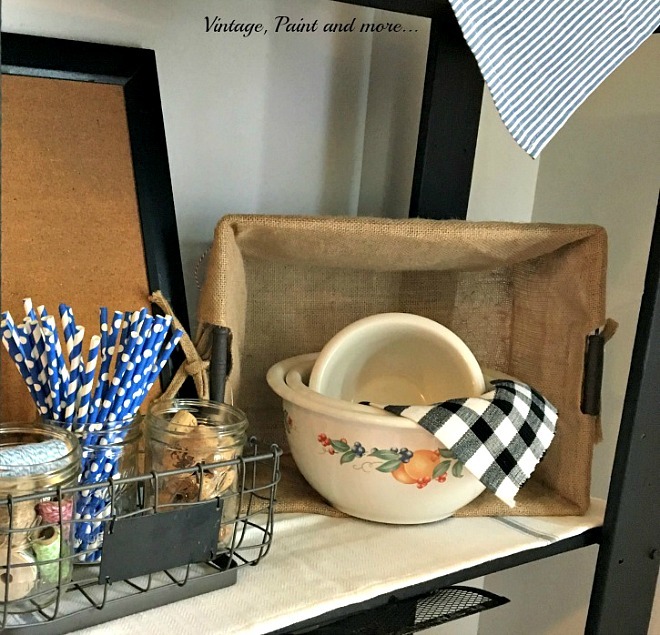 The little wire basket to the left I found at a thrift shop and filled with mason jars holding baker's twine, pretty little blue straws, and wine corks. Behind these is a thrift store cork board of which I like to change out with different little prints each season - I just haven't gotten around to it this season. The shelf is lined with a cotton tea towel that has a blue stripe. The third shelf is also a favorite of mine. 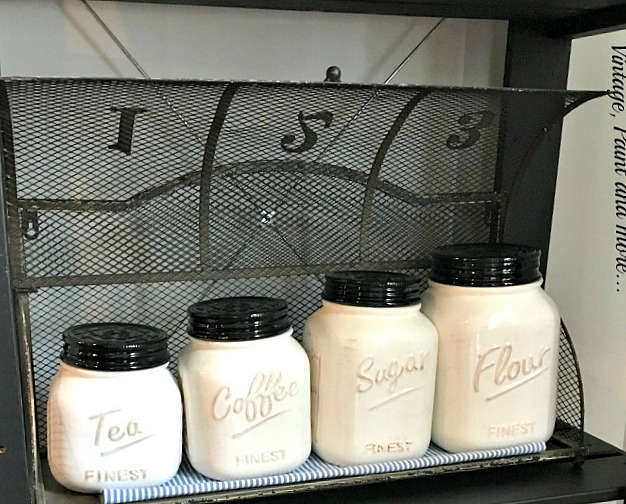 I found these mason jar canisters while out shopping last Christmas but didn't feel like I needed them at the time, although I fell madly in love with them. Well, lo and behold they found their way under the Christmas tree for me. Can you believe Santa knew how much I wanted those? They are sitting in a wire pie display safe I found at Hobby Lobby at a very deep discount again. Gotta' love those year end clearances. Under the third shelf, the previous owners actually added a small half shelf. This was perfect for a small burlap lined wire basket filled with cloth napkins. The very bottom shelf holds an old picnic/wine basket I picked up at a thrift store for very little. I put a black check napkin in it with two burlap sunflowers. The galvanized milk jug was found at Hobby Lobby on - you guessed it - very deep discount. 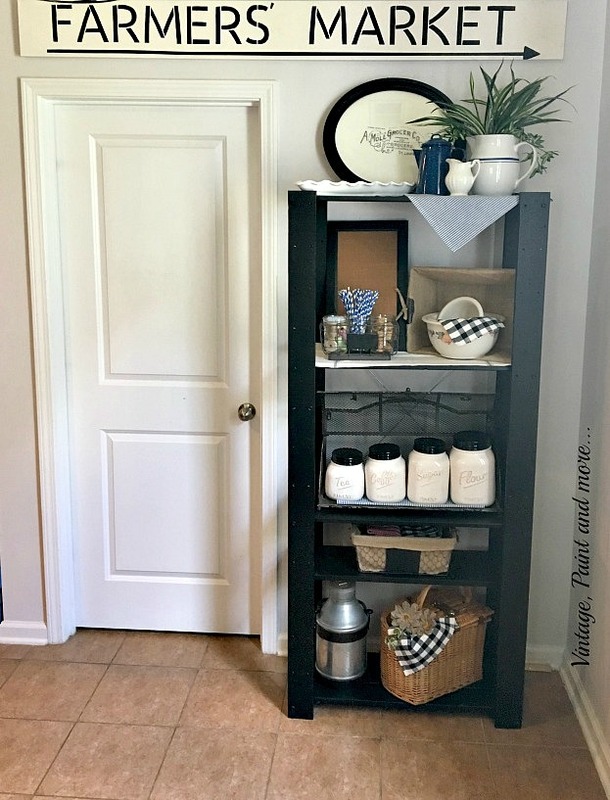 I absolutely love how this shelf turned out and how it just makes this little corner of our kitchen so special. With our "new" table and chairs (which I'll be sharing soon) it is one of my favorite places in our home. I love hearing from you so tell me what you've been up to lately. I will be linking to the parties listed on the Where I Party page at the top. Please stop by and check out the great projects and inspiration found at each one. 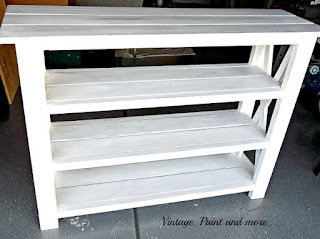 Your recycled/upcycled shelf unit is wonderful ... just like it was made for that space in your kitchen. Looks great with all your vintage goodies. The shelf unit turned out so cute Cathy, and I love how you styled it! Thanks for sharing with SYC. Thank you so much, Jann. It's fabulous, Cathy! I love the way you styled it, too. Beautiful! I love the way it turned out and you styled it so beautifully! Good job! Thank you Cathy, and thank you for stopping by. 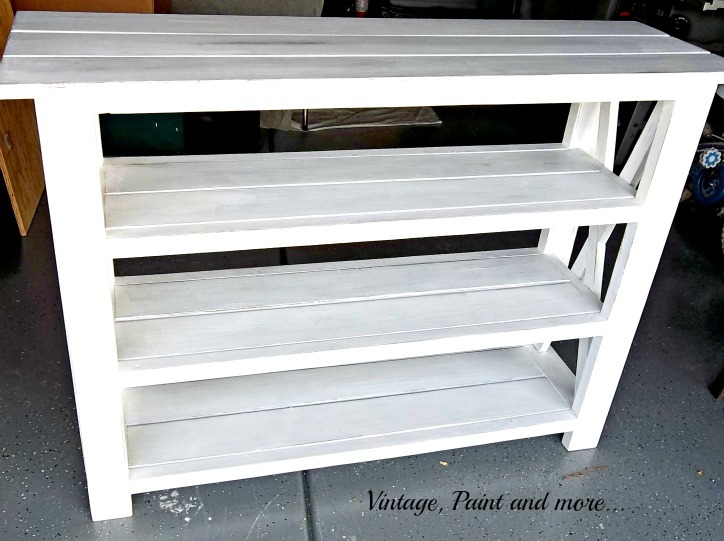 Cathy, I love that you upcycled a piece that was sitting in your garage and it looks wonderful! Thank you for sharing @Vintage Charm--pinned! I think it is the perfect addition in your kitchen! It looks very beautiful and holds so many items. Thank you for sharing at Sweet Inspiration Link Party! Love this shelf and how you added all the awesome decor. Thanks for sharing it with us at the Waste Not Wednesday link party. Keep coming back and linking each week.